Valentine's Day is just around the corner which means it's time to start thinking about Valentine's Day cards. I don't know about you, but I've never been a huge fan of store bought cards. They are almost always overpriced and generally include some type of cheap trinket better left in the garbage or, worse still, candy guaranteed to lead my kid down the inevitable path of a sugar crash. Luckily, handmade Valentine's Day cards are super easy and affordable. If you've fallen down the Pinterest rabbit hole recently, you know that there are a ton of super cute handmade Valentine's ideas out there. We've made our fair share, but these DIY Crayon Valentine's using old discarded and broken crayons are by far my favorite. Broken Crayons (I'm guessing you already have a ton if you have kids, but if not ask your child's teacher for the classroom's discarded crayons). Start by separating the crayons. Ones with a wrapper still attached go in one pile. Ones without a wrapper go in another. 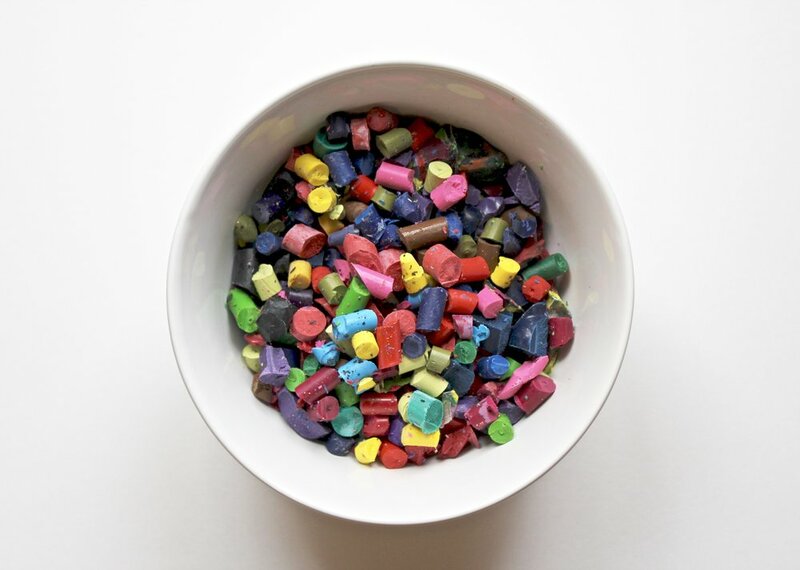 For the crayons that still have a wrapper attached, put them in a bowl of water for a couple of minutes. The water will help the wrapper to loosen making removal quick and easy. Once all of the wrappers have been removed, preheat the oven to 200° F then use your hands or a knife to break the crayons into smaller pieces. Load up that silicone mold with all of those little bits of crayons. We used the Robot mold found here, but molds come in all sorts of shapes, sizes and themes. There's no rhyme or reason to filling the molds. You can group similar colors together or you can make rainbow crayons but putting all different colors in one mold. I let the kids pick how they wanted to do it and we ended up with a little of both. The crayons will melt down quite a bit in the oven so be sure to slightly overfill the molds. Once that has been done, place the mold on a baking sheet for stability and then pop it in the oven for 10-15 minutes or until the crayons are completely melted. If they have melted down significantly, you may want to add a couple more pieces of crayon into the molds and stick it back into the oven for a couple of minutes. After the crayons are done, take them out of the oven to cool for 30-40 minutes. Once the crayons have hardened again, loosen them within the mold by gently pulling and stretching the mold. Carefully push each crayon up and out from the bottom, one by one until they have all been removed. To make these a complete Valentine's Day gift, you will want to add the crayons to a card. Sticking with the quick and easy theme, we found these adorable, printable cards by Little Lennons on Etsy. Just print them out on a color printer, cut them at the guidelines and then attach the crayons to the cards with the Zots. And, that's it! 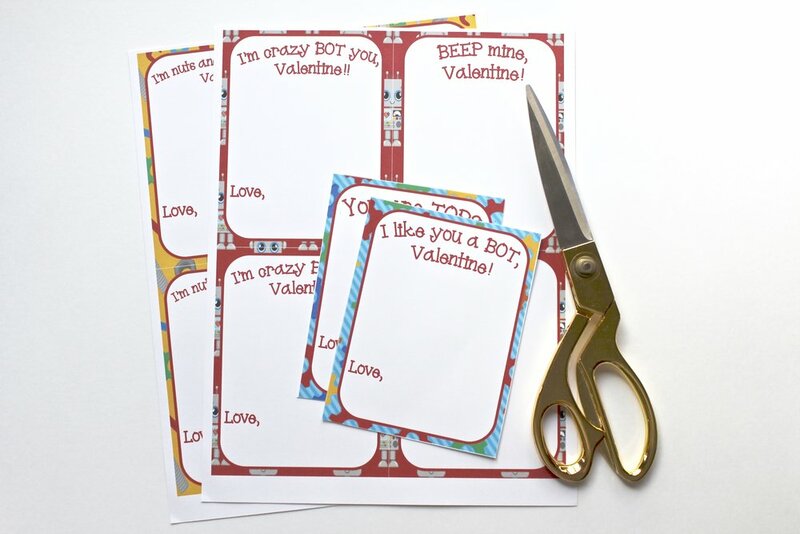 Super cute and easy handmade robot crayon Valentine's Day cards...minus the kids' signatures, which they'll be adding after nap. Looking for more DIY Valentine's Day card ideas? Follow us on Pinterest to see our favorites by clicking here. Love It? Share It & Save It.